Strobe connections Strobe connections are an essential part of the underwater hardware. Often, when things go wrong in the electrical circuitry that fires the strobes, the connections are the culprit. A broken or loose connector, a short out caused by leakage, a flooded sync cord etc. - the pop-up flash of the camera and a fiber optic cable to carry the light to the strobe sensor (lower figure, 5= internal flash plus cables). Most cropped sensor dSLR cameras have pop-up flashes. Almost all compact camera housings support this. Unfortunately, most dSLR housings do not have enough room inside the housing for the internal flash to pop up and fire the strobes. The problem of a pop-up flash is that it uses up more battery life, and also some compact cameras are very slow to recycle their internal flash. The lowest setting of the internal flash intensity (e.g. 1/64) is recommended. Some housings already have an optical cable insertion slot to plug in your fiber optic cables. 1. Uncropped camera systems often do not have a built in flash. But a nice innovation here is a fast optical (LED) trigger on the hot shoe that does not drain the battery and has less heat build-up (its the same set up as shown in the lower cartoon). These triggers are rather bulky, so they need a specially designed housing that supports these units. However since the LED signal output of these triggers is not as strong as the signal from a pop-up flash, not all strobes are compatible. LED based triggers also allow fast shooting sequences, perfect for fast moving action. The camera does not not have to wait for the popup flash to recycle, meaning faster shooting, that is as fast as your external strobes can handle or you buffer can take. 2. On some electrically triggered strobes its possible to attach a adapter plug on the strobes bulkhead. This transforms the optical signal received via an optical cord into an electrical signal, sometimes even preserving the TTL option. These adapters also allow triggering your strobe by a remote light source like a pop-up flash or even a LED trigger. 3. TTLis an option that is mostly used by macroshooters. TTL circuitry can be built in the housing or in the strobes. It will work with sync as well as with optical cables. I never use TTL. TTL is certainly not recommended for wide-angle UW photogaphy. Using the manual settings on your strobes will allow you to create a more balanced lighting of your subject. 4. Future housings might offer fiber optic as well as electrical connectors for strobe triggering. 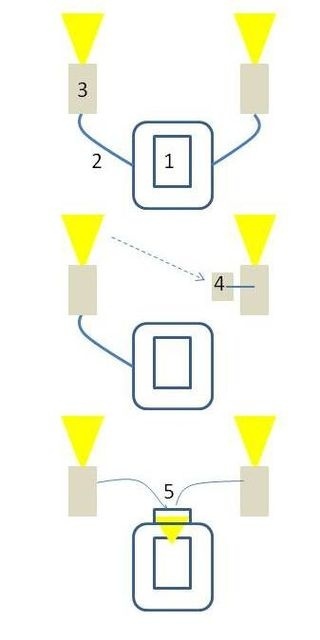 The corresponding strobes will then also accept electrical as well as optical input. Strobe positions The cartoons below show some popular strobe positions seen from above. Left: macro (1:1, flat port), middle: fish-eye lense with the subject very close (10-50 cm, strobes pulled backward and close to the housing), right: wide angle with the subject further away (e.g. 1-2 meters). Here in the horizontal plane the 9-3 and 10-2 o'clock positions will often give satisfactory results. If you are close to a sandy floor, its better to keep your strobes a bit higher to avoid over- exposure of the sand. For macro shots (left position) you can turn the strobes inward to create a focused light bundle on your subject, or more outward to avoid backscatter of particles drifting in front of your port. Backscatter will often not be a big problem with macro shots, since the subject of interest and small particles floating in the water will have about the same luminance. For CFWA shots the middle position seems to be most appropriate. Here the primary subject you want to catch in your light beams can be pretty close like at 10 cm, so in this respect its a bit like macro shooting. But since you are using a fish eye lense, you have to pull the strobes to the back in line with the handles and close to the housing to avoid the strobes or 'hot spots' entering your image. This will also improve the quality of your lighting of the nearby subject. The general principle for wide angle: put your strobes further apart and more forward for subjects at a greater distance. And slightly pivoted outward to avoid back scatter (right position). Alex Mustard, a master of underwater lighting, also recommends the crossed strobes for objects close to the domeIt resembles a bit the CFWA position; the strobes are also pulled backward in line with the handles, but now on long arms furher outward and pointing towards the object. This position is recommended to enhance texture of a large object or lighten up a small object in a darkish environment, like a cavern. How many strobe arms should you use? With a large object further away, two arms at each side of the housing will give you a greater reach and spread of light. For example, the short arm (e.g. 5 inch) near the housing and the longer (e.g. 7 inch) near the strobe. Some people even use three arms which when spread out look like gigantic spiders. Strobes will then need to be set at full power. But if you are shooting with a fish eye lense your target will often be very close to the lens, and the strobes should be much closer to the housing and pulled backward. In this case just one arm at each side of the housing might be a good solution and easier to set up, with the strobes set at less power. Balancing light When you are shooting wide angle, you enter the domain of mixed lighting: the quality of your pictures depends on the balance between a strobe-lit foreground and an ambient light-lit background. The balance becomes even more critical for CFWA shots taken with a fish eye lense and a very close foreground subject. Its important to realise that the effect of your strobe on an UW subject depends on three factors: its power setting, the aperture of the camera and the distance to the subject. Shutter speed plays no role here. Since the foreground subject will be very close to your camera and strobe, its exposure will be strongly affected by the light of the strobe as well as the aperture of the camera. Alternatively, exposure of the background depends on both the aperture and shutter speed of the camera. But since it lies at a greater distance from the strobe, it will be more affected by ambient light than by the light of the flash. Choosing a longer shutter speed then seems a good option to control exposure of the background. The take home message: strobes control the foreground, shutter speed the background. A useful strategy in CFWA shooting is to start with the strobes set at half power. Since both strobes are at the same distance from the foreground subject (see middlepicture above) they can be set at the same power. Then select the aperture to get the correct lighting of the foreground, and as a final step adjust the shutter speed to bring in that nice blue background. When the object is off-centre be aware that you need to reduce the power of the strobe closest to it. Uneven lighting when shooting CFWA pictures may also turn up with vertical shots and the cameral slightly tilted upwards. Here the closer lower strobe needs reduced power to prevent unnatural 'uplighting'. Snoots Snoots are extensions of a strobe, most often used in macro photography to create a sharp and narrow bundle of light on a small object such as the eye of a blenny (see the macro section for references). In a simple snoot the width of the light bundle depends on its length and the front opening (see two pictures below). Snoots can be very helpful in murky water, to lighten up a small subject at a short distance. But they can also be of use in wide-angle shooting to lighten up more tightly a foreground subject like a fish or a anemone, while still preserving the background blue. Or to lighten up a nice anemone of soft coral in a cavern without affecting the natural lighting of its interior. An example is shown below in two topside pictures. The left is taken with ambient light. 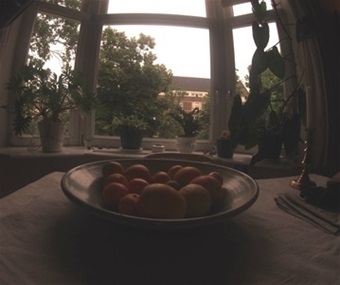 In the right picture (taken with the same settings) the lighting of the oranges on the foreground with a self made snoot did not affect the exposure of the background. Here the narrowness or edges of the light bundle are less critical . Snoots used in combination with macro is getting a more and more technical issue. Some examples: what tripod, how to focus your snoot, using one normal strobe and a second strobe with with a double snoot on its front etc. *Underwater photography masterclass. Alex Mustard. 2016. Ammonite Press.